“Cherry eye” is properly called PROLAPSE OF THE GLAND OF THE THIRD EYELID. Dogs have a third eyelid in the inner corner of the eye nearest the nose. It serves as a “windshield wiper” distributing the tear film over the eye. It also contains a tear-producing gland which accounts for about 50% of the tear production in the eye. In young Shar-Pei puppies, this gland will occasionally break loose from its attachment in the third eyelid and “pop” up and appear as a swelling in the corner of the eye. It often will appear red and inflamed, although it doesn’t seem to bother the dog too much. This condition must be surgically corrected using a “tacking” procedure which re-attaches the gland to its position in the third eyelid or a “pocket technique”. While it is not a difficult surgery there is about a 10-20% recurrence rate and the surgery has to be repeated. Some veterinarians advise removal of the gland, but this could result in decreased tear production later on and a condition known as “dry eye” or KCS. In my opinion the “pocket technique” is the easiest procedure and should be tried first. In the Shar-Pei, entropion may be a complicating factor in cherry eye in that the eyelashes rub on the third eyelid and may cause irritation resulting in prolapse of the gland. The eyelids may be tacked along with the cherry eye correction. The above diagrams illustrate the basics of the pocket technique. 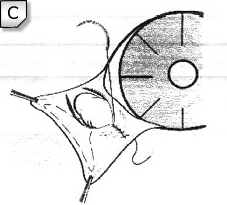 Diagram A. shows the initial incisions made parallel to the edge of the third eyelid on the inner surface, above and below the prolapsed gland. 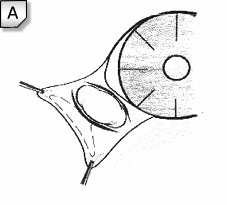 In Diagram B. a pocket is created by undermining the bottom incision in the direction of the medial lower conjunctival fornix – the posterior or bulbar portion. 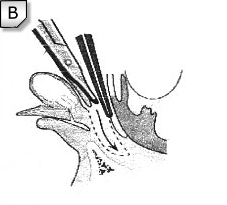 Diagram C. shows the suturing together of the two incisions using 6-0 Vicryl™ in either a continuous or interrupted suture pattern. The knots should be buried and the ends of the incisions should be left open a little bit to allow drainage of tears from the pocket which prevents formation of a “pseudocyst”. 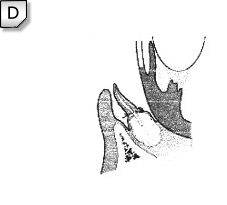 Finally, Diagram D. shows the final position of the gland of the third eyelid following this procedure.